Syncrify is a private cloud backup utility, perfect for both home and corporate environments. Through Syncrify multiple computers can backup files and folders to a central repository usin the rsync protocol over HTTP. 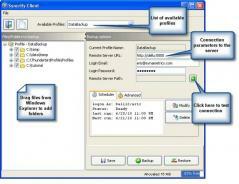 The application will only copy the modified parts of the files during the backup process, making it extremely fast. You can install it on any machine from your network and Syncrify will ensure everything gets backed up as plannd while keeping the files within your network for maximum privacy and security. Any user from another machine can access and download the backed up files. Syncrify supports all popular platforms – Windows, Linux and Mac OS X – and you can also use it to backup files over the Internet. If you’re looking for a reliable backup solution for home to prevent data loss for your entire family, give Syncrify a try – it’s free for home use!